Located on Empire Avenue and just two blocks from Park City Mountain, this bright condo sleeps 6. The free city-wide shuttle stop is across the street; hop on for a short ride to Deer Valley Resort, Canyons Village and historic Main Street and other exciting activities and attractions. The master bedroom has a king bed and private bathroom and there are two full beds in the second bedroom. A queen sofa-sleeper in the living provides some extra space to spread out. This unit features an upgraded full kitchen and plenty of seating for dining and hanging out; 6 at the table and 5 at the counter. 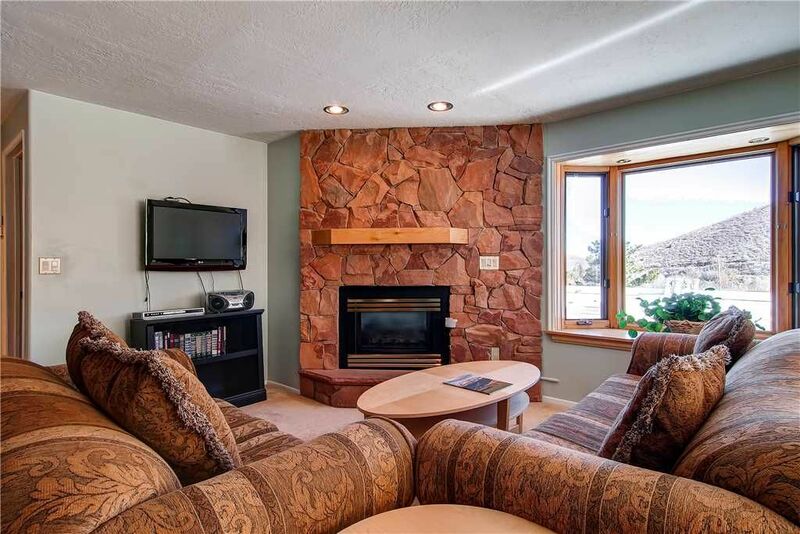 Comfy seating around the stone framed, gas fireplace and large TV makes it easy to relax after the day's adventures. The complex features a common area swimming pool and hot tub in winter/summer seasons, men's and women's saunas, central laundry facility, free wi-fi and underground parking. Moderate rating. Convenient location to Park City lodge and bus stop right out front door to Main St. The unit needs some work ! Well...where do I start with this review!? The property sits between two streets that have quite a change in elevation...Read many stairs! There were 68 stair steps from covered parking to get to our the R unit. The under structure parking is a plus, but requires some effort to get to our unit. Plenty of space for the 3 of us. Easy 5 minute walk to the Park City Village and Crescent/Pay Day lifts. Stops for the bus line is right in front of the place. Would stay here again. Great location. We were a short walk from the slope. Well worth the price to not have to hassle with a car each morning and allowed for our group to get started at different times when needed.